"Diamond Row" - upcycled blues quilt top #30 finished! 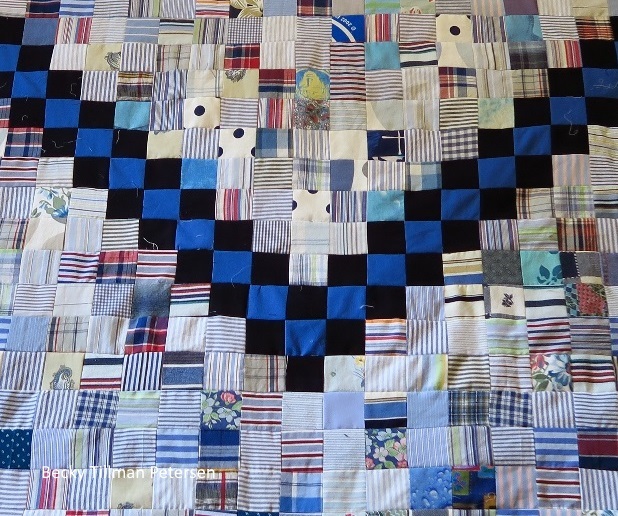 I made this design quite a while ago - not long after I started making upcycled quilts - when I found myself with a lot of light shirting and I wasn't sure how to use them. I thought it turned out pretty well, and have kept it in the back of my mind for possible use again. I realized that I wanted to pull it back out as an option as I had way more lights than mediums and dark blues. I really do like easy quilts - especially for using up scraps like this! I hope some of you can use the pattern! It's here! It's mostly just the diagram and layout for the design itself. I am assuming you know how to strip piece as I explain how I made this pattern. Here is a close up of the fabrics. This will give you an idea of what I have (had) so much of! Oh, and this one is "upcycled blues" top number #29. For now I'm skipping Lacy Chains - just because I've not had the time to write up the pattern yet. I've just had too much "life" happening lately to do it! Don't forget you can keep up with this particular series by going here.